If you’ve upgraded to iOS 9 on your iPhone or iPad you may have noticed that your data plan is being burnt through much quicker than normal. There’s been a lot of talk about this in the last week or so since the introduction of iOS 9, but can we tell what is truth and what is just rumour? The supposed culprit is a new feature in iOS 9 called ‘Wi-Fi Assist’. This post is really to let you know it exists – as many are oblivious to this new setting – and that it really can cause you to use more data than you expected, all without you knowing! But, it also allows us to highlight something that we should all be thinking about – which of our iPhone or iPad apps and functions we should be preventing from using cellular/mobile data at all. Some of these apps are very data (and battery) hungry and if you are on a limited data plan it just makes no sense to allow them to chew through your allowance! We’ll look at that in the later section of this article. But first, what is Wi-Fi Assist and what do you need to do about it? Wi-Fi Assist is an introduction in iOS 9 that’s designed to ensure that you maintain a stronger connection in areas where the Wi-Fi signal drops out or becomes unreliable. When that happens, Wi-Fi Assist (having noticed the poor connection) switches to your 3G or 4G mobile/cellular connection. Although it’s true that Apple are being proactive in introducing this feature, which is clearly designed to prevent endless loading times when you’re connected to a poor Wi-Fi signal, it can cause real problems if you’re on a limited data plan. It’s obviously a great idea and not an issue for those with an unlimited data plan on their phone contract but for those on a limited data plan it has the potential to start using up your valuable allotment when you aren’t even aware of the usage. And that really is one of the core reasons that this new feature has been getting bad publicity in the last week or so. The thing is, Wi-Fi assist automatically switches to your cellular connection when it has noticed that your Wi-Fi has become unreliable. It does not notify you in any way. And, on top of this, the default setting after you’ve installed iOS 9 is to have Wi-Fi Assist switched on. So, there’s a lot of people out there who have installed iOS 9, that have Wi-Fi Assist switched on and whose limited data plan is being gobbled up by a setting they simply don’t know about! So what can you do to prevent Wi-Fi Assist automatically switching on your cellular data when you are in a poor Wi-Fi connection and thereby protect your valuable data limit? The answer is that if you need to, your only option is to switch it off. At least that way you’ll know it’s not flipping to your cellular data allowance without your knowledge! Well, the setting is right at the bottom of the section in your settings for Cellular/Mobile Data (that’s just what it’s called in the US/Europe – it’s the same settings!). Go to Settings > Cellular (or Mobile Data) and you have to scroll all the way to the bottom of that page to find Wi-Fi Assist and toggle the switch to off (remember White is off, Green is on). Here’s a video from a tech YouTube channel that advises switching off Wi-Fi Assist and shows you where to find the setting. But is that the whole story and is it really Wi-Fi Assist which is to blame? 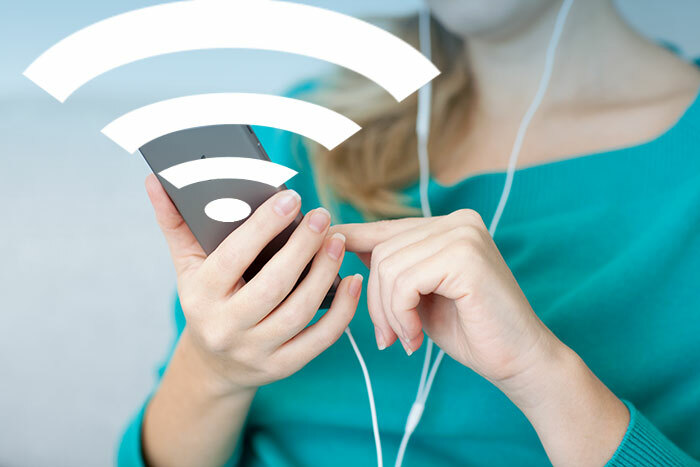 Is Wi-Fi Assist the real culprit? Even if you’re on a limited data plan (and more than half of all iPhone users are) Wi-Fi Assist is a great addition to iOS. Apple aren’t stupid and although they don’t directly care about your phone contract and how much data you can afford to use, we all need to remember that they introduce new functions like Wi-Fi Assist because they make the experience and usability of their device better for you – their customer. And, if you manage it well, Wi-Fi Assist is a great new function. With it enabled, the key advantage is that any service that relies on streaming data is going to be more stable. So, downloading emails from the cloud or your office server on your morning commute as you pass between home Wi-Fi, train station hotspot or wherever won’t mean frustration and delay. And the same thing is true with services such as Netflix, YouTube or Apple Music. And that’s where we get to the root of the issue. The most recent evidence is that we are all using more data than ever before and indeed in a recent Techlicious survey they discovered that 34% of people run out of data on a limited plan every month. In a younger age group, this figure grows to 48%. Just short of half! Although Wi-Fi Assist is causing you to use more data, unkowingly, what we should all be looking at is what apps we have allowed to use Cellular/Mobile Data at all! 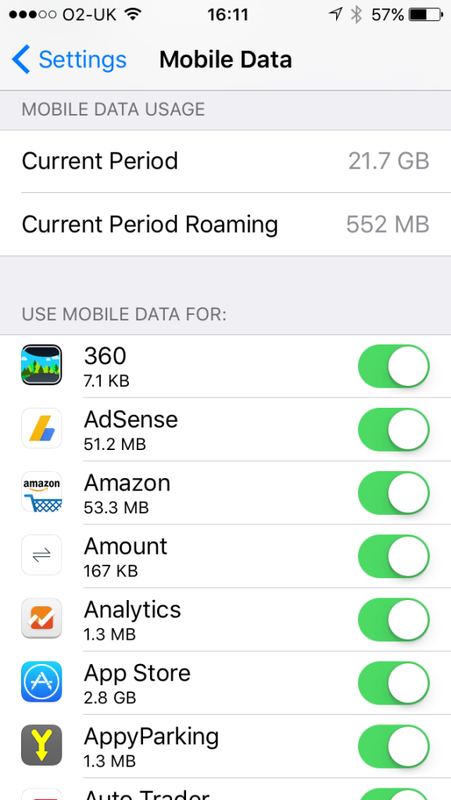 If you are one of those near 50% of iPhone users who run out of data every month, you must be using your data for something…a lot! 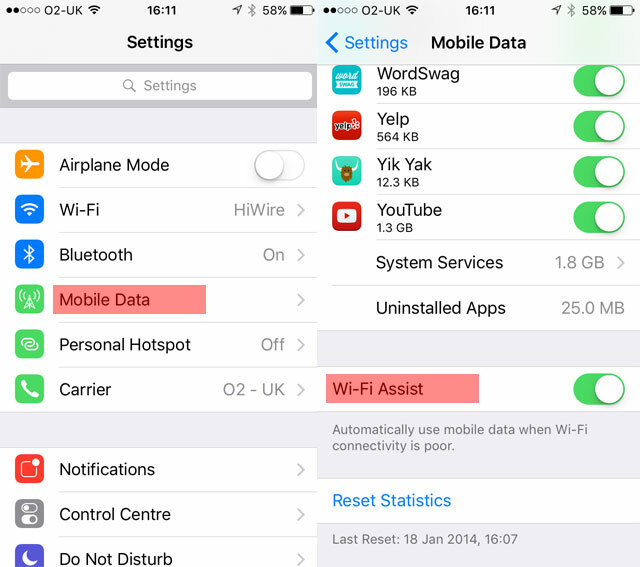 Disabling that usage in your settings will mean that your iPhone cannot ever use cellular data to stream for that specific app – and then you can leave Wi-Fi Assist switched on since it can only switch to data for apps that you have enabled for cellular/mobile data. You see, ultimately, it’s not Wi-Fi Assist that’s to blame for using up your data plan, it’s what you’ve been allowing your iPhone to use over cellular all the time that eats up that plan. In that same cellular/mobile data section (Settings > Cellular (or Mobile Data) > Scroll down) you will see that every app and function of your iPhone is listed under a section called ‘Use Mobile Data For’ (‘Use Cellular For’). This lists all your apps in alphabetical order and underneath each it will show you the amount of mobile data that has been used by that specific app. This means that you can easily scroll through the list and identify those apps which have been using a lot of data over your cellular connection. You then clearly have the option of toggling off access to your mobile data only for those apps which are using a lot / too much of your mobile data. 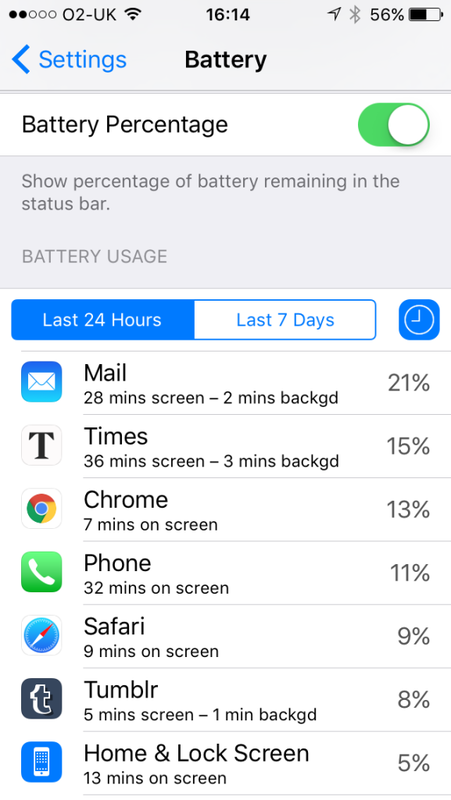 You might also find that your iPhone battery usage information tells you a lot about which apps you’re using the most (or which are running in the background). Although there isn’t a direct correlation between the battery usage and data usage, they are usually indicative of each other. Go to Settings > Battery > Scroll down to Battery Usage and tap the clock icon to see the amount of time each app has been on screen. (That’s in iOS 9. In older iOS, simply go to Settings > General > Usage > Battery Usage – you’ll get the usage information but, of course, whilst older iOS allows you to limit access to mobile data, there is no Wi-Fi Assist). Once you’ve identified the apps that are using up your data over cellular you’ll be much better informed on how to limit their use (just by not using them on the go, away from Wi-Fi) and able to make decisions about which to deny access to cellular/mobile data. We cover a lot more detail on this and related issues to dramatically improve the performance of your iPhone in our guide – ‘Double your iPhone Battery Life’. So, Wi-Fi Assist is a double edged sword. If you have an unlimited data plan, leave it on – you have nothing to worry about! But, if, like most of us, you have a limited data plan, you need to know it exists and how to switch it off….but, much more importantly, use this as an opportunity to get your mobile / cellular data usage under control by looking into it on an app by app basis. In short, don’t go streaming video and music on a regular basis when you aren’t connected to Wi-Fi – and restrict your settings so that you can’t!